Rahim Al Haj's Odyssey with the Oud The ancient stringed instrument has taken the Iraqi musician from Baghdad to New Mexico. He talks about his journey and his new CD, When the Soul Is Settled: Music of Iraq. 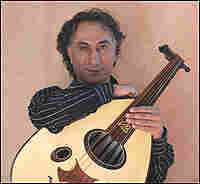 Rahim Al Haj first encountered the oud as a boy in Baghdad. When he was a young boy in Baghdad, Rahim Al Haj picked up the oud, an ancient stringed instrument that predates the European lute. The oud would become the center of his life and provide the soundtrack of a journey that took him from Iraq to America. Now he lives in Albuquerque, New Mexico. He brings his oud along for a conversation with Jacki Lyden about his new CD, When the Soul Is Settled: Music of Iraq.